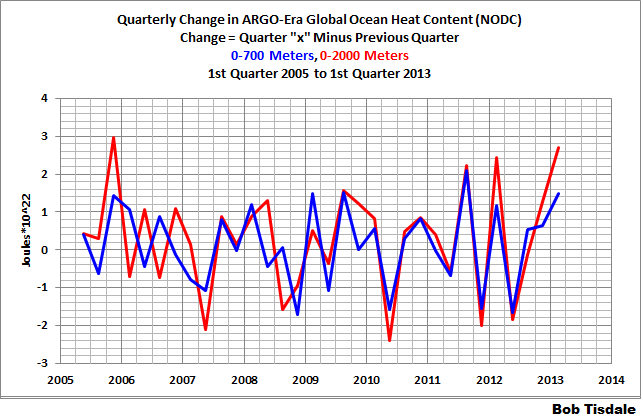 First we have to assume David Appell is discussing the ARGO-era data, because the NODC presents the ocean heat content data for 0-2000 meters prior to the ARGO era only in pentadal form—as a result, it shows no quarterly wiggles due to the smoothing. Once we agree on that, then David Appell appears to have difficulty reading time-series graphs, or he purposely overlooked the sharp rise in the 0-2000 meter data near the beginning of the ARGO era. Note: If the subject of ocean heat content data is new to you, refer to the post Is Ocean Heat Content All It’s Stacked Up to Be? It’s a long post, but it contains a lot of information about the problems with the ocean heat content data. We’ll first look at the global ocean heat content data in terms of the average temperature anomalies of the global oceans for two depth ranges, just to keep things in perspective. We’ll start with the quarterly data for the period beginning in 2005 for both depths—recall that the NODC only provides 0-2000 meter data here on a quarterly basis starting in 2005. The heat content of the World Ocean for the 0–2000 m layer increased by 24.0 +/- 1.9 x 10^22 J (+/-2S.E.) corresponding to a rate of 0.39Wm^2 (per unit area of the WorldOcean) and a volume mean warming of 0.09 deg C.
The heat content of the World Ocean for the 0–700 m layer increased by 16.7 +/- 1.6 x 10^22 J corresponding to a rate of 0.27 W m^2 (per unit area of the World Ocean) and a volume mean warming of 0.18 deg C.
With those relationships roughly established, the first graph, Figure 1, presents the quarterly changes in average temperature anomalies of the global oceans to depths of 0-700 and 0-2000 meters, where the change is presented as the value for a given quarter minus the value of the previous quarter. The most recent change in the average temperature of the global oceans at 0-700 meters is comparable to two other quarters and has been exceeded by a change in 2011. For the depth of 0-2000 meters, the quarterly change in the last quarter of 2005 was slightly more than the recent change. Now, examine Figure 1 again, please. Note how small the changes are from quarter to quarter. For depths of 0-2000 meters, the changes are about +/- 0.01 deg C (that’s one one-hundredth of a deg C), and for 0-700 meters the changes are on the order of +/- 0.015 deg C (and that’s fifteen one-thousandths of a deg C). Does anyone really think that 3300 ARGO floats, which constantly require corrections, are able the determine the temperature changes of the global oceans to that accuracy—to depths of 700 meters (about 2300 feet) and 2000 meters (about 6550 feet or about 1.25 miles)? If we look at the time-series graph of the average temperature of the global oceans for the depths of 0-700 and 0-2000 meters, Figure 2, we can see that the rates of warming (based on the linear trends) are comparable. 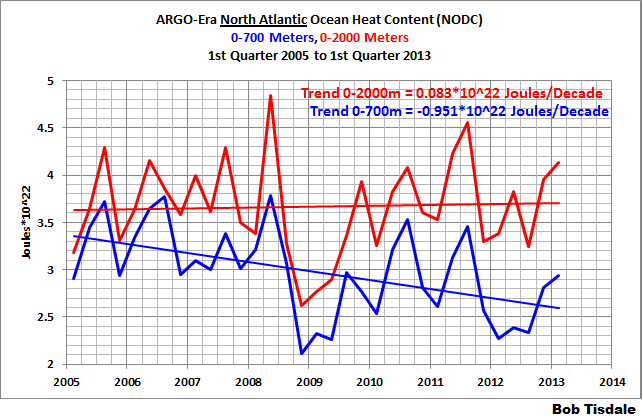 That is, the data for 0-700 and 0-2000 meters both show the global oceans warming at rates of about 0.03 deg C/decade. 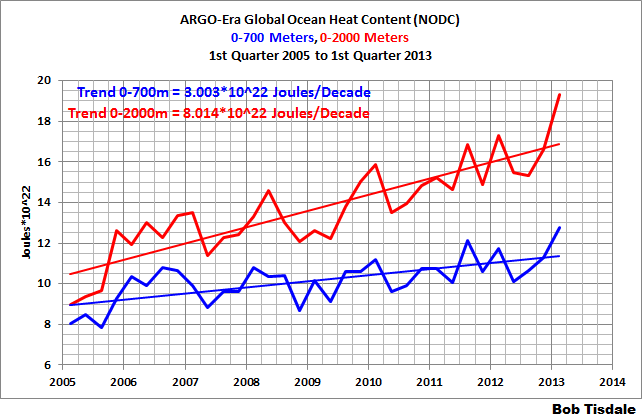 The ARGO-era ocean heat content data for both depths are presented in the standard form of 10^22 Joules in Figure 3. 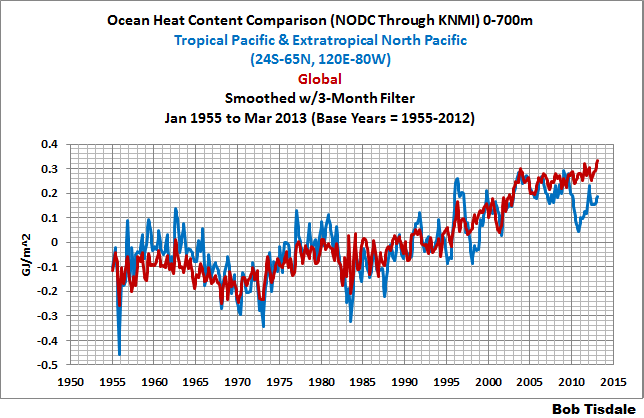 While the temperature changes for both depths are similar, Figure 2, the 0-2000 meter data has a higher ocean heat content trend because it includes a larger volume of water, Figure 3. Using annual data, we recently examined the North Atlantic and North Pacific data for both depths in the post Ocean Heat Content (0 to 2000 Meters) – Why Aren’t Northern Hemisphere Oceans Warming During the ARGO Era? Presenting the data in quarterly format and including the data for the first quarter of 2013, doesn’t significantly alter the results of that post. The North Atlantic continues to show very little warming for depths of 0-2000 meters, Figure 5, and cooling at depths of 0-700 meters. 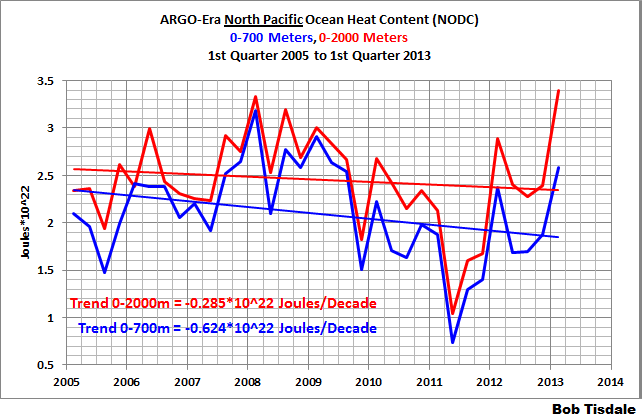 For the North Pacific, Figure 6 presents the ocean heat content data for both depths. Both show cooling, with the 0-2000 meter data cooling at a lesser rate than the 0-700 meter data. We’ll check back in another quarter to see if there have been any drastic changes in those trends and to discuss if there are any peer-reviewed papers based on climate model simulations that explain the recent flattening and cooling of the ocean heat content data in the North Atlantic and North Pacific. So far, I haven’t run across any papers, and when I’m talking of climate model-based papers, I’m thinking of the climate models in the CMIP5 archive that are used to hindcast and project global climate—not one-off ensembles of simulations designed for a specific purpose. We’re going to switch to the KNMI Climate Explorer as the source of data for the following discussions of ocean heat content for the depths of 0-700 meters. The ocean heat content data for the tropical Pacific (24S-24N, 120E-80W) and the extratropical North Pacific (24N-65N, 120E-80W) warmed in very specific ways. Both subsets of the global oceans show multidecadal periods of cooling interspersed with sudden warmings that are tied to natural phenomena—both subsets indicate that without those natural phenomena those two significant portions of the global oceans would cool since 1955. And there’s also another curiosity when you combine those two subsets. So far, the climate science community has never presented (or I have never found) a climate model-based peer-reviewed study that explains why ocean heat content in the tropical Pacific (24S-24N, 120E-80W) cools for the multidecadal period between the La Niña events of 1954-57 and 1973-76 and cools for the multidecadal period between the La Niña events of 1973-76 and 1995/96. See Figure 7. And they’ve never explained how and why the long-term warming of the ocean heat content data for the tropical Pacific is dependent on the three 3-year La Niña events of 1954-57, 1973-76 and 1998-01 and on the freakish La Niña of 1995/96. It’s plainly obvious that the ocean heat content of the tropical Pacific would cool over the long-term without the 1973-76 and 1995/96 La Niña events. And it’s very tough to claim manmade greenhouse gases are responsible for the warming while the oceans are cooling for multidecadal periods. 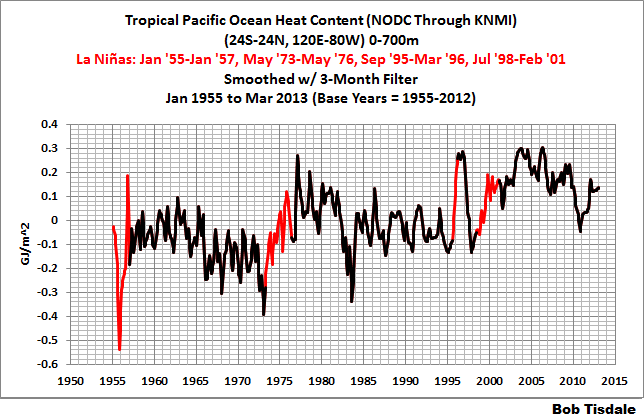 Note: The periods in red shown in Figure 7 are the official months of the 1954-57, 1973-76, 1995/96 and 1998-01 La Niñas as presented in NOAA’s Ocean NINO Index. Also keep in mind that the installation of NOAA’s Tropical Atmosphere-Ocean (TAO) Project floats was completed in the early 1990s, so there’s been continuous coverage of subsurface temperatures in the tropical Pacific since then—but before the TOA project floats, the sampling was sparse, very sparse. I continue to find it quite remarkable that we can even find the impacts of the 3-year La Niña events, and the dip associated with the 1982/83 El Niño, in the data for the period before the installation of those floats, especially when we consider how sparse and random the sampling was before the TAO project buoys. Figure 7 portrays the recharge-discharge oscillator function of La Niña and El Niño events, with the highlighted La Niñas acting as the recharge mode and with El Niños in the discharge mode. It’s unlikely that climate modelers will, anytime soon, be able to explain the naturally caused warming of the tropical Pacific because climate models still cannot simulate El Niño and La Niña processes…even after decades of modeling efforts. Refer to Guilyardi et al (2009)—presented in the post here—for further information. The ocean heat content data for the extratropical North Pacific (24N-65N, 120E-80W) is presented in Figure 8. It shows long-term cooling, not warming, until 1988. Again, it’s very difficult to claim manmade greenhouse gases are responsible for the warming when the oceans are cooling for multidecadal periods. 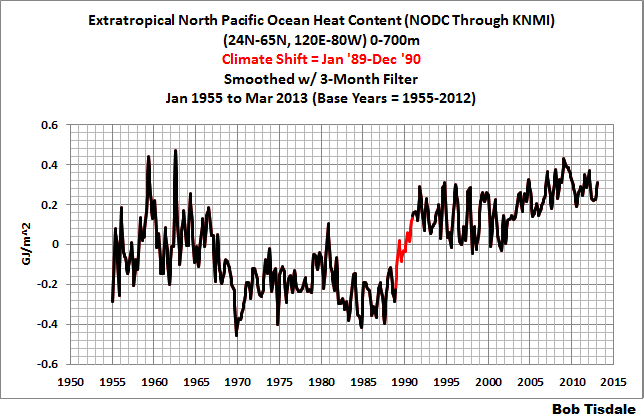 After that cooling period, there’s a sudden upward shift in ocean heat content in the extratropical North Pacific. I’ve highlighted the 24-month period of January 1989 to December 1990 in red to help illustrate the shift. There was a decade-long cooling followed by a gradual warming after the shift. But it’s blatantly obvious that without that 2-year shift, there would be a long-term cooling in the extratropical North Pacific. The late-1980s/early-1990s shift is also present in the sea surface temperature and sea level pressure data of the extratropical North Pacific. I discussed that in the post Ocean Heat Content (0 to 2000 Meters) – Why Aren’t Northern Hemisphere Oceans Warming During the ARGO Era? There I noted: Almost 2 decades ago Kevin Trenberth discussed the same wind pattern-based upward shift in the sea level pressure of the extratropical North Pacific. Refer to Trenberth and Hurrell (1995) Decadal coupled atmosphere-ocean variations in the North Pacific Ocean. See their Figure 6, which shows the sea level pressure of a portion of the extratropical North Pacific. One would think Trenberth should also know that same shift exists in extratropical North Pacific sea surface temperature and ocean heat content data. Earlier under this heading, I noted that there was a curious effect when the tropical Pacific and extratropical North Pacific ocean heat content data are combined. Individually, both show long-term periods of cooling followed by short-term bursts of natural warming, but the variations in the two datasets do not coincide. When they are combined, Figure 9, they present a more gradual long-term warming that is mimicked by the global ocean heat content data. And of course, the climate science community and other proponents of hypothetical human-induced global warming would like you to believe that the warming of global ocean heat content could only be caused by the increases in manmade greenhouse gases, primarily carbon dioxide. For more than 4 years, I’ve illustrated and discussed how ocean heat content data and satellite-era sea surface temperature data show no evidence of having been warmed by manmade greenhouse gases—that is, while the oceans have warmed, the data indicates they warmed naturally. If the natural warming of the global oceans is new to you, refer to my illustrated essay “The Manmade Global Warming Challenge” [42MB]. And if you’re looking for a much more-detailed discussion of the natural warming of the global oceans, refer to my book Who Turned on the Heat? It was introduced in the post “Everything You Ever Wanted to Know About El Niño and La Niña”. It’s for sale in pdf form for only US$8.00. The warming of the metric most commonly used to present global warming, surface temperatures, has stalled. Alarmists are looking for another medium to present continued warming. And logically they’ve elected to present the problematic and much-modified ocean heat content data—without discussing its problems or the adjustments made to it. And sometimes, in their desperation, alarmist bloggers make erroneous claims. So, what else is new? With ocean heat content data before the ARGO era, the measurements are so sparse we are unable “to observe the motions of thermal anomalies in the mid- and high latitude oceans” [Raymond Schmitt], and since the introduction of the ARGO floats, there are “issues of missing and erroneous data and calibration” [Kevin Trenberth]. Phrased other ways: ocean heat content is not a reliable dataset—and—it’s not a dataset in which we should have confidence. This entry was posted in Ocean Heat Content Problems, OHC Update. Bookmark the permalink. Amen, brother. After they figure out how to properly use Argo data, should we tell them there’s ocean underneath the 2000 meter mark? I have been thinking about the deep ocean heat uptake data. There is something which seems unphysical about more energy accumulating in the 700-2000 integral (over a 10 year period) than is accumulating in the 0-700 volume integral. Since much of the excess accumulating heat in the ocean owes to extra downwelling longwave from the added GHG forcing (or perhaps more SW reaching the ocean surface from natural long-term changes in clouds or the sun) this excess heat should be observed first in the shallowest portion of the well-mixed ocean. Let’s assume for simplicity that averaged over a year, the TOA radiative imbalance is approximately 1 W/m^2. Based on the approximate magnitudes seen in the OHC time series, about 60% of the radiative flux is being mixed into the 700-2000 integral, while only about 40% of the radiative flux is being accumulated in the shallower volume. There are indeed many results in physics which turn out to be “non-intuitive”, but if these measuments are accurate, I am baffled about the mechanism which could allow this to occur over an 8-10 year period. My bet is that there is some kind of systematic measument error. The fact that the slope of the temperature rise in both integrals is roughly the same is almost too coincidental. Some knowledgable folks need to look carefully into the raw data, the magnitude of the uncertainty in the variables, then show a P10, P90, and P50 after about 10,000 trials. A P50 with a shuffled deck may look quite a bit different than the deterministic calculation. This will tell us if the cone of uncertainty swamps our measument and methodological precision. The deeper the ocean measurements, the more precise must be the salinity and temperature measuments, since the changes in the nominal values get very small. Several years ago, I vaguely recall some public discussions with Josh Willis where this was made explicit, but possibly the oceanography community is more confident of these measurements now? If these results are robust, then we have a *very* turbulent ocean which behaves in ways we had not previously anticipated. Just to be clear, the radiative imbalance is not 1W/m^2. I simply gave that to illustrate the point, but in retrospect, I should have taken the time to convert the heat content change in Joules to W/m^2. My point still holds that the majority of the radiative imbalance over the time series is being sequestered below 700 meters. Trenberth says in his recent paper, that only *30%* is going below 700 meters, but that is not what is being shown in the time series above. The 8*10^22 Joules accumulated from 0-2000 is approximately equivalent to the TOA radiative imbalance over this period. Only about 3/8ths of this total energy has accumulated in the 0-700 volume integral (3*10^22 Joules). That is what seems unphysical to my intuition. Just had a quick look at the Levitus paper. They are showing the 700-2000 integral accumulating heat much more slowly than the 0-700 integral, which is the way things should work. Are you sure you have not made an error in your Figure 3? It does not seem consistent with Levitus or Trenberth, and indeed it is counter-intuitive. “The heat content of the World Ocean for the 0–2000 m layer increased by 24.0 +/- 1.9 x 10^22 J (+/-2S.E.) 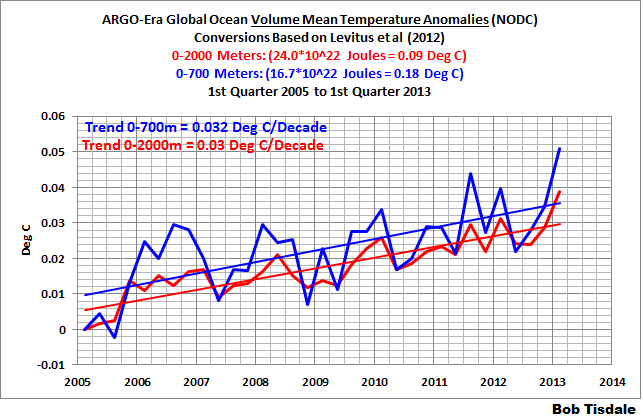 corresponding to a rate of 0.39Wm^2 (per unit area of the WorldOcean) and a volume mean warming of 0.09 deg C.
Bob, the quote above suggests that out of 24 units (total) of heat which accumulated in the 0-2000 integral, 16.7 units of this occurred in the 0-700 integral. 16.7/24=0.69. This figure is roughly equivalent to the “30% going below 700 m” quoted in Meehl et al (2013). Levitus converted Joules to Wm^2, and this is also the same (0.27/0.39=0.69 for the 0-700 integral). So there is either 1) a systematic error reflected in your graph in Figure 3, or 2) if the Argo data interpretation is robust, the last 8 years of OHC changes indicate a phenomenon which is remarkable (ie deep ocean is warming faster than the shallow ocean). I agree with you that your graph appears to reflect what is being reported, but it seems interesting that more folks have not seemed to pick up on the remarkable nature of what it seems to indicate. Bryan S: The quotes you provided were for the entire terms of the data, not the data since 2005 as I have presented in my Figure 3. Have you downloaded the data and plotted it to see if my graph is right or wrong? Yes. Your graph indeed appears to be plotted correctly, as this seems to be an accurate depiction of the interpretation released by the NODC. 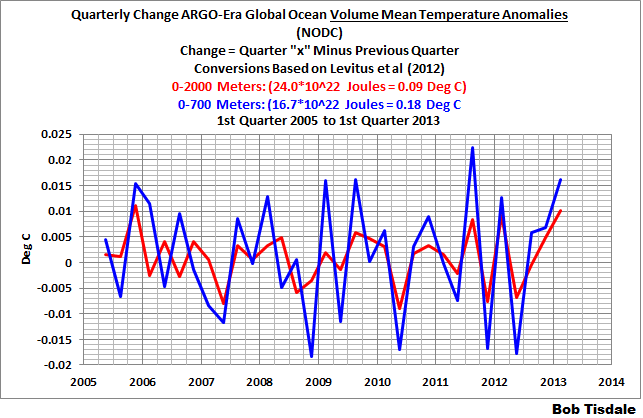 My point is simply that *if* the Argo data interpretation you plot is correct, then it provides a quite remarkable and new insight into how the ocean circulates. My suspision is that the result may *not* turn out to be robust, and systematic measurement or methodological calculation errors will eventually be revealed. It intuitively seems unlikely that turbulent gyres (natural variability) might continually mix down this much heat over a decadal period, so that the majority of heat passing through the shallower well-mixed layers is “funneled” off into the abyssal ocean, but again, sometimes in physics, results can defy intuition. then the model depictions of the atmosphere/ocean system will be shown to be inadequate for providing much useful information about the future state of the global climate system. And I agree. The climate science community will have to realistically portray coupled ocean-atmosphere processes and the resulting variations in sunlight at the surface (and penetrating the ocean surface) in their models before they can ever hope to determine why, when, where and how climate varies.